The enormous 59-foot Gundam statue in Tokyo is pretty cool. Projection mapping makes it even cooler. Projection mapping certainly isn't new. But recently, it's become increasingly popular in Japan. Take Osaka Castle, which kicked off a cool projection mapping show late last year. 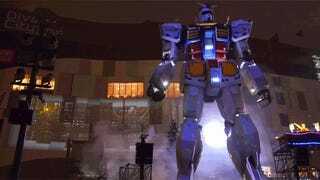 Japanese site Gigazine recently checked out the Gundam projection mapping event at DiverCity Tokyo Plaza. Check out the footage below. Things really start happening at around the one minute mark.